On The Edge is the industry’s most popular sharpening newsletter. If you are a professional sharpener that focuses on scissors, shears, and clipper blades, this is the publication for you! Each issue is packed with sharpening, sales, and business articles that with help you grow your sharpening business. Looking to learn? Looking for help? Look no further! On The Edge has been helping sharpeners succeed since 2002! Want to see what On The Edge has to offer? Click here for a quick look. 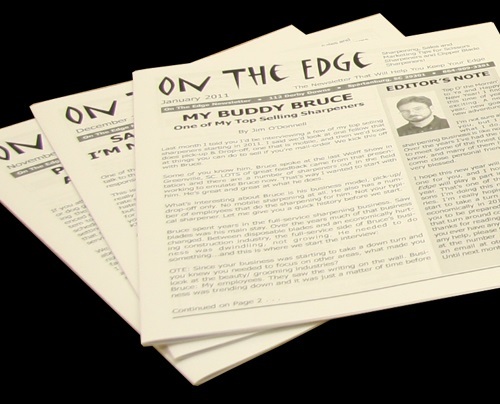 To find out how to order your subscription to On The Edge, click here. Have some other questions and want to talk? Give us a call at 864-909-3381. Jim O'Donnell has spent the past 20 years helping small business people grow and expand their businesses! He has been in sales and marketing all his life and has spoken both locally and at conventions and meetings all over the United States. His students consider him their go-to guy because he is driven to help his contacts find answers to their needs; and he's willing to do his best to find them! Marketing, selling and networking is about helping others, not them helping you! Jim exemplifies this in both his work life and personal life!